Too Hot to Handel: The Jazz-Gospel Messiah is your grandmother's choral classic sliced, diced, spiced, swirled, swung, amplified, and totally reinvented. In its ninth annual incarnation at the Auditorium Theatre, this jazz-gospel riff on the Messiah is a hothouse of talent, with lush, thrilling vocals by soprano Alfreda Burke, alto Karen Marie Richardson, and dynamite tenor Rodrick Dixon. 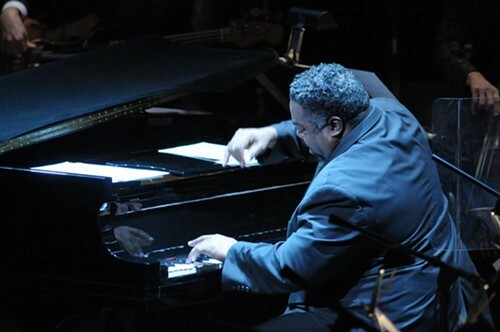 Also, a virtuoso jazz band, a symphony orchestra with a rocking brass section, and members of the Rackham Symphony Choir joined by more than one hundred local choristers, all anchored by the truly grand piano of Alvin B. Waddles III. And I'm not usually a fan of video in live performance, but thanks to very strategic use of it here, every seat in the gorgeous old theater has an intimate view. Longtime Old St. Patrick's Church music director Bill Fraher wrangles the chorus; Suzanne Mallare Acton conducts. Bob Christianson and Gary Anderson arranged and orchestrated. You can still catch it today at 3 PM at the Auditorium Theatre, 50 E. Congress. Tickets are $25-$68 at the box office or Ticketmaster. There'll be a postperformance discussion with the artists.